TORONTO, ON--(Marketwired - February 25, 2016) - The Canadian Centre for Economic Analysis (CANCEA) welcomes the Ontario government's renewed call for a federal partner on infrastructure in its 2016 Budget. CANCEA's independent and cutting-edge research on this topic is clear: relevant public infrastructure investment is more crucial to the prosperity of a region than previously estimated. Without sufficient and appropriate investment, future economic growth and related prosperity would be at significant risk. Speaking about Ontario's 2016 Budget, CANCEA President and CEO Paul Smetanin notes "Historically, federal contributions to public infrastructure have been inadequate. The federal government's pledge to increase funding for public infrastructure is a step in the right direction and it is hoped that with it brings a new era of intergovernmental cooperation. This is a critical issue for the future prosperity of the country, and we look forward to seeing how Ottawa will step up to the plate in its upcoming budget. We thank the Ontario government for highlighting our research in this area in their 2016 Budget." 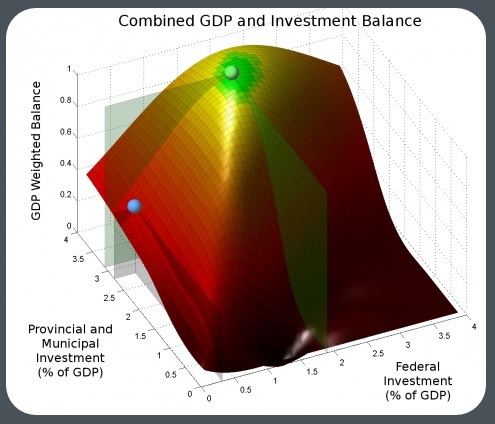 A 2015 CANCEA report -- highlighted in Ontario's 2016 Budget -- found that if a sustainable investment strategy maximizes economic returns while minimizing the risks for "investors" (i.e., different tiers of government), then the federal government would contribute about 38% of investment in Ontario. Currently, the federal government is covering only 11%, less than a third of what is required. This evaluation was done using CANCEA's unique research platform called Prosperity at Risk that utilizes agent-based modeling and a systems approach. CANCEA is a state-of-the-art interdisciplinary research organization that is dedicated to objective, independent and evidence based analysis. They have a long history of providing holistic and collaborative understanding of the short and long term risks and returns behind policy decisions and prosperity. In order to maximize economic growth while maintaining a fair balance of risk and rewards to infrastructure investment across government tiers in Ontario, the Federal Government should be investing up to 1.9% of Ontario's GDP in infrastructure, with the Province and municipalities contributing an additional 3.1%, the green dot in Figure. The current trends are indicated by the blue dot.